Previously on C3 Church Watch, we published this article on a C3 pastor who would be “facing five years in prison for his part in a bank fraud scheme involving real estate investors”. We now have found prior information on this incident. ASHEVILLE, N.C. — An Asheville pastor faces five years in prison for his part in a scheme to defraud a local bank by using so-called “straw borrowers” to get $825,000 in loans. The Asheville Citizen-Times reports (http://avlne.ws/yHxoMX) that Nicholas Dimitris (dim-EET’-rihs) pleaded guilty to a conspiracy charge in federal court last month. Dimitris admitted to being part of a scheme to use straw borrowers, or stand-ins for the real recipients, to get loans from Pisgah Community Bank. The 37-year-old is the pastor of C3 Church in Asheville. A call to his lawyer, Ronald True, was not immediately returned Tuesday. Along with a maximum of five years in federal prison, Dimitris could also face a fine of up to $250,000. It wasn’t immediately clear Tuesday if a sentencing date has been set. NOTES: ALL SCREEN GRABS WERE TAKEN ON 14/01/2013. And the big question for the day is what denomination leaves a guy pastoring a church who has pleaded guilty to conspiracy to commit bank fraud? 95% of public figures would step down after a guilty plea but not this guy. That’s quite correct, and the other 5% would be forcibly removed, as would be right and proper. There is no accountability in C3; they are a law unto themselves. Phil Pringle, as leader of this movement, should act forthwith to address this shameful situation, but apparently this man – who presumes to lecture those in the corporate world on how to conduct business – either has no grasp of ethics whatsoever, or is totally incompetent (or perhaps it’s a combination of the two). Incidents such as this underscore the fact that C3 is indeed a gnostic cult, and that those at the top of the pyramid don’t give a fig for the truth. When you love your position more than you love the church or the reputation of the Lord or the church, you hang on for dear life. And especially if that position is a well-remunerated sinecure that has the added bonus of all manner of perks and tax breaks. Love of position and love of money – what wonderful examples some C3 pastors are. Or if you were a pastor and you were to launder your failed business money through your church and you can’t quit until you get it all back…just kidding, that could never happen. I recently confirmed that Dimitris has multiple judgments against him in North Carolina for unpaid debts. [Edited out] Dimitris has been fired by two different churches in the community. He has legal trouble in both his personal and private life and C3 allows him to remain in leadership. (Of course he is not mentioned on the website). He must bring in a lot of money for Phil Pringle, or maybe he’s just cooking the books. Why anyone would belong to his church is beyond me. We can be sure of one thing Dimitris will self-destruct again soon, just watch the headlines. Yes he will. The clock is ticking. Where do you get this information from? His ex wife served in the US Military for six years. They would not of let her enlist if that charge were true. Probably another one of his lies. They divorced because of abuse. The man his ex wife married worked with the youth – not was a youth. They started dating 3 years after all youth group involvement stopped. She was not his pastor. After she left Nick, he spread horrible, horrible lies about her, telling everyone she was mentally ill. I’m pretty sure Nicks the one with mental issues. Check your facts!! Don’t bring his innocent victims into this. That’s really sad; if you were at least under investigation, you could at least afford “innocent until proven guilty”. 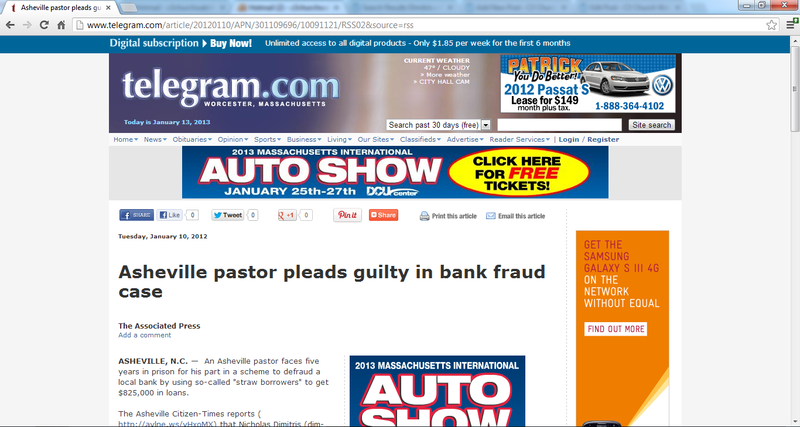 This bloke has pleaded guilty, and he’s still a senior pastor. Why doesn’t anyone do anything? What will happen if he has to go to jail? I commend you for being one of the few people that has the guts to speak up against Nick Dimitris. Many are afraid (myself included) knowing that he has a history of isolating the person who stands against him and then engaging in character assassination on a massive scale to discredit anyone who dares speak out. He is also litigious and a very convincing liar. You can’t be taken by a conman who is not good at what he does. Dimitris is really good. Holly endured a decade of hell being married to him and then he lumped all the blame on her to everyone he knew so grace and peace to her. From those of you who may be more theologically and life versed than I – a) how does God promote someone into this position? Or was it never God in the first place? And b) why aren’t the Sweetmans or Pringle doing anything about removing him? As someone said – if you did this in the corporate world, or even more conservative churches, they’d be out on their backside. Standard operating procedure for cults – and thus something that speaks volumes about exactly what sort of organisation C3 is, and the nature of the spirit behind it. What will Nick Dimitris say when he has to give an account of himself at the judgement? The churchwatcher account is a shared account, so our views may vary on this. We will post you this scripture. Here are some statements from the US Attorney’s Superseding Indictment of Dimitris involvement with the Seven Falls Fraud. This is a public document and is in no way a violation of privacy. It does shed light on why he plead guilty. PCB (Pisgah community Bank) Loaned Chapman(named as defendant in indictment), CMH (Dimitris held company) and Somily (Dimitiris wife’s company controlled by him)approximately $2.8 million in three separate loans designed to conceal the fact that these new quid pro quo loans violate PCB’s loan policies as well as FDIC and… regulations. The proceeds of these loans were disbursed (to various co-conspirators to include) $134,000 cash out to CMH, Somily and other entities controlled by Dimitri who acted as, and recruited his wife to act as a straw borrower. Another $100,000 loan (was used) to payoff an existing loan by Somily at PCB. Parenthetical used to add clarity. Thanks for that info Law Dog. Yes, he pleaded guilty because he is guilty. There’s no way around the fact that he received $234,000.00 in kickbacks within a very short time of recruiting others to make those loans. The big lie for his church is that he stood in front of them and stated that all he did wrong was buy a block of land from some people that were being investigated by the feds and that he was cooperating with the feds. He didn’t mention that he actually recruited straw borrowers and that he received $234,000.00 in kickbacks. He misled his church, his oversight and continues to mislead today. Would someone please help me understand how someone can plead guilty for bank fraud charges in a federal court and 16 months later…still awaiting sentencing? His church is still a happening thing. The bank president was sentenced to prison at least 8 months ago. How can a judge wait so long to sentence someone…and why? We have done our best to honour your request. If you see any other comments that need to be addressed, please notify us and we will remove the information at your request. Law Dog quoted from a public document – so we wish to respect the information to that document. It is indeed a sad situation and we sympathise with all those who have been victims in this C3 Scandal. Thank you very much for removing those remarks. It is greatly appreciated! I just don’t want to see my family put through anymore pain. Thank you again. Actually Ethel, comments have been taken down that mention the person in question. You use an anonymous name yourself, unless your mother named you Ethel. It is not the commenters on this site that have pleaded guilty to conspiracy to commit bank fraud is it? That’s just the one thing he’s actually being held accountable for. The United States of America vs Nicholas DImitris – how do you plea? Guilty your honor. No witnesses needed. The veiled witness in the dock is not needed because he admitted guilt. Case closed, now on to sentencing. Please refrain from mentioning peoples names who may have been affected by this scandal. It is clear that many people feel they and others have been hurt by C3 Asheville and Nick Dimitris. But spreading rumors and allegations about others who have been hurt only causes more pain to the ones who have had to walk through it and embarrassment to have their pain made public. Let us pray in secret that God may reward them openly. Q: What’s the difference between lawyers and C3 pastors? A: Some lawyers have integrity. By litigation I was referring to the people being named who requested that their information be removed, but, I see, some of it still remains. A simple search by c3churchwatcher would identify where those comments are. You can’t go around using people as weapons against their will when they ask you not to. I doubt C3 would bother with this site or with you, but others might, who are not bound by the Word to rather suffer than sue. But, should they so desire, there would be more than enough evidence remaining on this and its sister blog for proceedings. Some of the claims being made on various subjects are outrageously speculative to the point of being defamatory. I am not advocating legal action. Merely pointing out that, whilst it might not be expedient to take such drastic action, it is also incumbent upon the site managers here to remain circumspect about the comments being made by anonymous contributors, checking their facts, and not taking every comment as necessarily accurate or demonstrable evidence. It is also very noticeable that, whilst the staff here seem to consider their work to be journalistic, they have never once in any post given evidence of having even made an attempt to seek the opinion or confirmation of the people they have levelled accusations against. I do not speak for anyone but myself, and this is entirely my opinion. “I doubt C3 would bother with this site or with you, but others might, who are not bound by the Word […]”. So you consider that C3 is “bound by the Word”, do you Ethel? Can we take this as prima facie evidence that you *do* consider Phil Pringle to be orthodox? Surely anyone who is “bound by the Word” wouldn’t prove to be heterodox, would they? Surely they wouldn’t preach lies and heresy, would they? Tell me, Ethel: if you yourself pastored a church, would you allow Phil Pringle to preach there? And what do you consider your work to be, Ethel? Are you one of those journalistic watchdogs? Or are you an aspiring uber-pastor whose days are filled with the mundane as you eagerly await the moment when you are noticed by someone senior in the gnostic hierarchy of your personality cult? Ah! Look at Igor Ethel huffing and puffing to defend his master. Why don’t you answer Zorro’s simple question? Is your master Phil Pringle orthodox, Igor? Jesus is my Master, churchwatcher No man is my master. Especially Zorro, although he yearns to be. Huffing and puffing? No! I’m very relaxed. In fact, I think it’s Zorronymous who is struggling to strain the gnat of his shopping list of condemnation. Come on, lad, push harder! And now you’re stepping out form the shadowy wings, licking your lips, flexing your biceps, egging him on, carrying his coat, gleefully anticipating bloodsport, because you can’t wait, can you, to join the stoning? You’ve always wanted to be a rock star! The way lust is displayed is often intriguing. But, as I say, no reason to hurry, or be pressed into compliance with zero tolerance teeth-nashers. There’s plenty of time, unless, of course, Jesus comes today, in which case we’ll all find out soon enough, won’t we, who will get through and who won’t, what is orthodox, and what isn’t. So, where were we? Oh, yes. So you want to join in. What do you consider to be orthodox? We can’t move on until we all know what you think orthodoxy is, since you’re asking the question. So why are you so deathly afraid to tell the truth about Phil Pringle? Don’t you know that fear of man is a snare? If you were relaxed, you would simply answer the question. That such questions stick in your craw shows you to be one who lacks the courage of his convictions. You have no integrity; you have sold yourself out to a movement that is false. 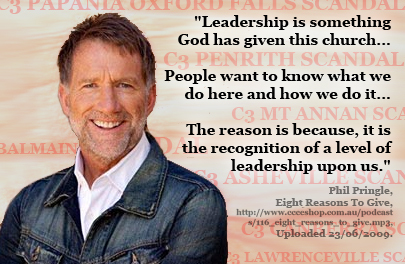 If you were a pastor, would you let Phil Pringle preach at your church? You’re starting to carry on like a stalker, Zorro. Obsessive, secretive and elusive with it. The artful dodger. Do you ever discuss anything else with anyone on blogs apart from knocking these people and anyone who is dissenting towards churchwatcher blogs? If you or your apprentice can’t define orthodox, I’m through with you on this. It’s funny when we ask you, “Is Phil Pringles orthodox” your criteria sums you up perfectly. Answer the question or go away. So, since I did not begin this sequence of questions, and it has nothing to do with the thread, if I then ask you a question to qualify your question before the question can be answered but you avoid answering the question which qualifies the question I am then asked to answer the unqualified question or go away? Will you go away if you can’t answer the qualifying question? Why can’t you simply define ‘orthodoxy’ so that we can proceed? You want a definition as a “fulcrum for debate”, but we are not interested in a debate on what constitutes orthodoxy. We are asking a question; specifically we are asking *you* if you consider Phil Pringle to be orthodox – that is, according to your understanding, not ours. Of course, we can understand the predicament in which you are left by that question: it leaves you squeezed into a tight little corner, hence your persistent prevarication. It’s important to have the courage of one’s convictions, but that’s pretty hard for you because you don’t have any convictions, do you? Except, perhaps, that “success” as measured by bums on seats is the way that a “ministry” should be rightly judged – that the Kingdom of God, to the extent that it is manifest on earth, is nothing more than one big popularity contest. You can’t answer the question because you are nothing but one more mealy-mouthed mediocrity in a veritable parade of vacuous wannabes. You are an object lesson in what happens to those who sell out; who prefer the ways of this world to the perfect way that is found in God alone. Well I’m not in any predicament. It’s your problem that you can’t get what you want. I am a slave to no one. You requested an opinion which contained ambiguities, so I asked for qualification of your position. Perfectly reasonable. Since you refuse to answer what your criteria for orthodoxy is the conversation is over. The question is this: “Do you consider Phil Pringle to be orthodox”. That is a closed question: the answer can be either “yes” or “no”. Except in your own very confused mind, the answer doesn’t depend on what anyone else thinks; it is based solely on your own opinion of the matter. However, as we all know very well, you cannot answer the question in either the affirmative or the negative without compromising yourself, so you squirm in an attempt to avoid it – as would any double-minded and characterless pretender. Sell outs are like that: insipid, weak-kneed cowards who are invariably shallow and transparent in equal measure. So now you and the apprentice want to discuss the nuances of the ambiguities of the word orthodox. You must realise that all five of the regular followers of this blog would know very well that neither you nor churchwatcher have the slightest interest in allowing an simple ‘yes’ or ‘no’ answer to an ‘open’ question, even if they were pertinent to the question asked. You will not accept my response in good heart either way. I have merely anticipated your counter, as any cognitively harmonious person would, knowing your track record with commenters on this blog, coupled with the fact that every comment I make is monitored and moderated by churchwatcher, and some do not make it through, depending on whether churchwatcher can handle them or not. Therefore I approach each submission with a degree of well founded caution, because each could be my last, bearing in mind I have been threatened with expulsion on at least two occasions. I would not like my last standing comment to be one which is used as an example of negativity, as has happened to a couple of other commenters, whose frustrated comments remain on these pages, with dismissing remarks by you or churchwatcher, without the liberty of response, a freedom you enjoy. If I say ‘yes’ to your question, you will come back with some degrading remark to the contrary, demeaning both to my person and to the subject of your obsession, which I will then, justly, refute and ask you to explain carefully in more detail what you consider to be orthodox, with the entire qualification based on your own understanding of what orthodoxy consists of. On the other hand, if I say ‘no’ you will go off as you did elsewhere in some triumphal march of self-congratulatroy celebration because you incorrectly thought you had caused someone to say something seemingly negative about your target group, and further depreciating remarks will be made by you and churchwatcher about my person and the object of your constant derision. So, given your propensity to this kind of disrespectful behaviour, I have every reason to sit tight and wait until you at least have the courtesy to outline your understanding of orthodoxy so that I can respond. There is no ‘yes’ or ‘no’ answer to your question by the way, because the question itself demands a query, which is why I am persisting with this direction. I could say ‘yes’ and you could answer by utilising Roman Catholic Orthodoxy that the object of your attention could not be orthodox because he doesn’t teach purgatory, or transubstantiation, or Mary worship, or any number of doctrines no Protestant would hold to. Or you might, as I suspect, hold to a Calvinistic orthodoxy and we would know that you would never agree to my understanding let alone that of the majority of your target group. But at least I would be in a position to discuss with you why your orthodoxy might have flaws, and you to me also on mine. But you want more. You are not interested in a rational discussion on doctrine. You seek a scalp. How would I know what your orthodoxy might be, or churchwatcher’s orthodoxy? I thought churchwatcher was Reformed or Lutheran judging by his recommended resource list on this page, but he claims there are a number of orthodoxies represented by the ‘team’. So what are they and how do hey differ from one another. How will you judge the orthodoxy of another person but by your own? So, I’ve been wisely saving a long and arduous debate by anticipating your next move, followed by mine, cutting to the chase, and asking what you consider to be orthodox. Because, as I have shown, it is ambiguous, and needs to be better defined. Then he follows up with another of his painfully long-winded posts. Jesus said let your “yes” be “yes” and your “no” be “no”, but Ethel can’t bring himself to give a straight answer as to whether he considers Phil Pringle to be orthodox or not, and he can’t even get his story straight with regards to whether or not this “conversation” is over. (And it’s not a conversation at all, of course; it’s Ethel making a complete fool of himself, in public, by stonewalling to avoid facing the uncomfortable truth – that he will condemn himself out of his own mouth no matter what he answers). There is one true Gospel and there are many false ones, Ethel. If you had read your Bible, your would know that. Tell us: does Phil Pringle faithfully preach the true Gospel, or does he muddy the waters by purveying lies in God’s name? If you ever reached the point where you had your own church (yes Ethel, miracles can happen), would you let Phil preach in it? Would you let him fleece the sheep who should be in your care and under your protection? Do you think that Phil is more important than others in God’s estimation, and that guarding his reputation and considering his feelings is more important than showing faithfulness to the One who died in our place? While we are on the subject of false teachers, do you think that Kong Hee is orthodox? Will he go all WOF on the jury at his trial? Will he rebuke the judge in Jesus’ name, and claim victory over the Singaporean judicial system by faith? I await your confused and thoroughly transparent attempts at distraction and obfuscation with interest – you are always good for a laugh. Well the conversation on whether I will say ‘yes’ or ‘no’ to your ambiguous question is well and truly over, and was as soon as it became apparent you didn’t have the necessaries to discuss what you meant by orthodox. That does;t stop me talking about anything related to the issue. The real joke is that you spend so much time humouring me! I find it interesting the way you have taken scripture so far out of context. The context for ‘yes be yes, or no be no’, was the law courts, keeping your word, and not swearing on heaven. 35 “nor by the earth, for it is His footstool; nor by Jerusalem, for it is the city of the great King. 36 “Nor shall you swear by your head, because you cannot make one hair white or black. 37 “But let your ‘Yes’ be ‘Yes,’ and your ‘No,’ ‘No.’ For whatever is more than these is from the evil one. So if I say I will not judge a person in a public forum, and, in response to your query, which you raised, I will not condemn a man to appease your hunger for controversy simply to feed you with ammunition for your own personal obsession, and would rather let you do the right thing and approach him yourself with the offences you have, then I will need to keep my word. And I have, haven’t I? Consistently. So my yes has been yes and my no has been no throughout. But who are you, Zorro? Who are you to ask anyone any question? To judge anyone? You’re nobody by choice. You’re nothing by design. You consign yourself to anonymity. Why? So no guilt can be aimed at you. So no association can be made with your real identity. So there is no accountability with you for any words or actions on this or any other blog. And what if you were right about anything you say? I don’t say you are wrong about everything. I do say you have a godless way of going about it. But even if you were right, your anonymity disqualifies you from any credibility. Who has to answer to a pseudonym? So do I, a son of God, have to answer to an empty hidden claimant to God’s Judgment Seat? Now if you had a name and a person behind that mask perhaps your words could carry some weight. But who, as long as you are nobody, could be offended at your confrontational way of doing things and come to you, as scripture tells us, to present that offence before you? No one. Because you are no one. So your words are nothing. Your anonymity as a judge is illegal, illegitimate. Facile. Except God knows who you are and you will be judged by Him for every idle word. But not I because you are not known to me, and your words are empty to me. Every Idle word. That means ‘every word which shuns the labour it should perform’. So, being anonymous, your words as judge are empty, and shun their true labour by your timidity and reticence to own them by revealing yourself and giving them credence by your own reputation. When you laugh at me from your secret lair, who cares? Does heaven shed a tear? In despair at your lack of brotherly kindness perhaps. Who, apart from a small handful of Zorro hero-worshipers on this site actually gives a rip? Who is really bothered what you think of whoever I am, because, as you plainly point out, who am I? I am nobody. You focus your attention on somebody you call a nobody! You’re a nobody by choice aiming accusations at nobody! In the great scheme of things I am base, weak and ignoble. I am a fool! What’s new! People laugh at me! I laugh with them, because, all is not lost, and I am a successful clown for them. But you keep coming back for more, like a pendulum. Tick, tock, tick, tock! You get nowhere, and you keep coming, until you make silly old clown Ethel the obsession. There’s something you should know about clowns though, isn’t there? The clown always has a custard pie to slap in the face of the grumpy patron. And you must love the taste of it, because here you are again! The thing is, God knows who you are. He knows what you are doing, and He knows what I am doing. That is all that counts. I’m sure you consider your conscience to be clear and your intentions pure, but, from where I’m sitting, you have as much to answer for in your petty world of subterfuge and hatred, as you claim the various ministries which you feed on have to answer for. But let God judge you as He does all. And we will all answer. We will all have our day in His Court. But this is a kangaroo court with faceless magistrates and veiled accusers. The evidence is rigged to assume guilt. The jury is selected by a process of croneyism and elimination of dissenters. This is not a recognised court of session in the place where it counts. This is a wood hay and stubble court. Do you have smoke alarms fitted? Doubtless you will dismiss this and come back with another pendulum swing. Watch out for the custard pie on the way back. That was a brilliant tap dance Ethel! You must have studied at Pringle’s Art and Leadership Colleges to be that good. It suits your personality quite well. OK can we just focus on more important things? Like is Dimitris gonna get sentenced soon? Hey, he pleaded guilty…. Hey people, any update on his sentencing? nothing that has been made public…so weird…but then again, so often those closest to the situation are the last to know. Vanity of vanities, saith the preacher; all is vanity. You see a man hasty in his words? There is more hope for a fool than for him. And the oracle of the Lord you shall mention no more. For every man’s word will be his oracle, for you have perverted the words of the living God, the Lord of hosts, our God.